The Lancia Ypsilon is out. 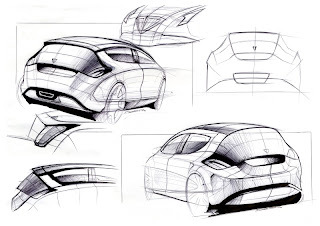 Is a project that I have participated at the very beginning in 2007, the initial sketches, latter I have left Lancia for a while, so the project was finished by the rest of the team. The guys in Lancia where so kind to publish one of them. Here it is, together with the other drawings from the team: Stefano Bertolo, Francesco Kundari, Gioni Ribotta, Giampaolo Caretto, Diego Vergnano, and so many more that participated in the project.